Film Review: ‘The Incredibles 2’! 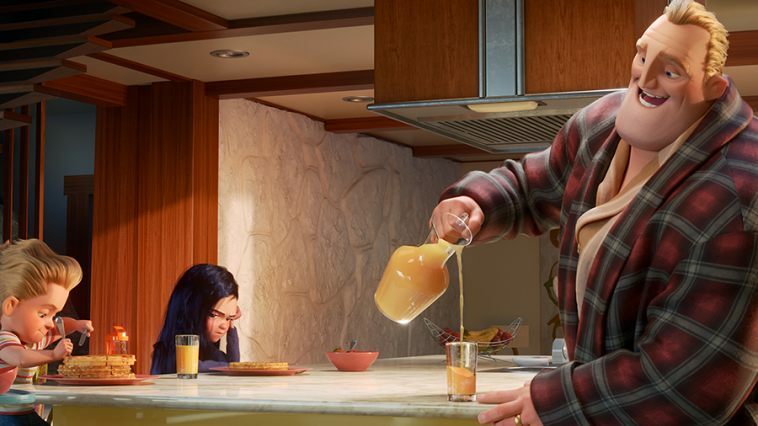 The Parr family is back in action in ‘The Incredibles 2‘ with more action, wit, and spectacular visuals that is guaranteed to thrill and entertain everyone who watches. It’s been 14 years since we last saw the Parr family come to terms with being superheroes in a world that doesn’t want them. Pixar really took a chance on their first outing with superheroes in hiring an outsider in Brad Bird to take the helm back in 2004. Before then, it was only Pixar people who got to make Pixar films, but with ‘The Incredibles‘, Pixar took Bird in as their own, most likely due to Bird’s amazing film ‘The Iron Giant‘. The result was magnificent with an intimate portrait of a family with love and problems all the same. Not only that, Bird set the story in the 1960’s in a noir spy thriller type of genre, complete with a fantastic score to go along with the time. I just can’t believe it’s taken this long to get a sequel. ‘The Incredibles 2’ starts out right where the first film left off, which is when the villain known as The Underminer appears and the Parr family straps on their suits to fight. From here, the world is still on the fence about letting the superheroes be a part of the community and actually fight crime. That is until a man named Winston Deavor and his sister Evelyn (Bob Odenkirk and Catherine Keener respectively) step in and tell the Parr family that they can market superheroes back in the good graces of the human race. They first want Helen/Elastigirl to work for them and fight crime without destroying the city first, while leaving Mr. Incredible to be a stay at home dad. It’s a great storyline to start out the film, that plays a little like ‘Mr. Mom‘ at first. Seeing how Mr. Incredible help with homework, his daughter’s boy problems, and realizing that baby Jack Jack has a ton of super powers is beyond funny and done perfectly. The villain this time around is known as the Screenslaver, who has the power to hypnotize people and make them do anything, including taking out superheroes. It’s a wonderful story on many levels. One aspect is that we get to see further development of the Parr home life and teenagers growing up, where we also get to see some social and political movements on screen that might mirror our own real times. The 1960’s setting is still in place and looks as gorgeous as ever. The Parr’s new home is magnificent looking too. There are a few amazing action sequences that takes the best of Spielberg moments and re-creates them here, which was fantastic to watch. One thing that is missing here is the heavy emotional tone that we’ve seen before in previous Pixar films. There is no need to shed a tear here, but that’s okay, because ‘The Incredibles 2‘ doesn’t need it. This is a great sequel and Pixar at its finest. Disney Gives Us Release Dates For ‘The Incredibles 2’ And More!!! This entry was posted on Wednesday, June 13th, 2018 at 1:18 pm	and is filed under Film, News. You can follow any responses to this entry through the RSS 2.0 feed. You can skip to the end and leave a response. Pinging is currently not allowed. « 4K UHD Review: ‘Forrest Gump’!